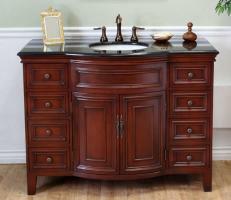 The elegance of the design of this single sink vanity will make a wonderful statement in the bathroom or powder room. The beautiful wood turned feet and the turnings and the deep ribbed texture of the posts at the front corner add a delightful artistic touch to this piece that will be treasured for years to come. The walnut finish is laid on in heavy and light touches to create a striped look that enhances the other decorative features. 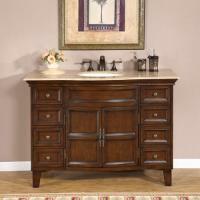 The antique brass hardware pulls are the perfect accent to the dark tones of the wood finish. 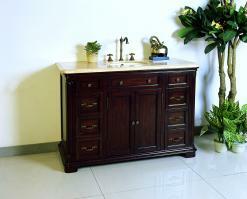 The size of this vanity, at almost four feet in length, brings great storage function to the space. 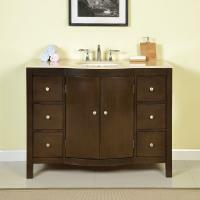 The double door cabinet will help to keep things neatly out of the way and organized a great asset in any bathroom. 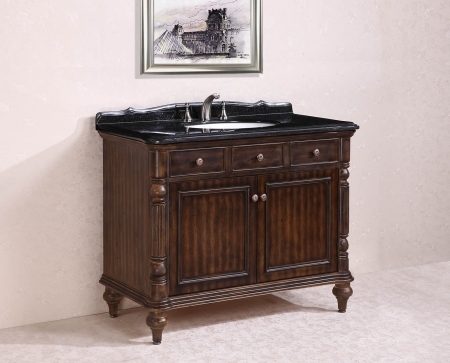 The dark tone of the black granite counter top adds a stunning touch to the piece and is complemented by the white ceramic of the under mount sink.